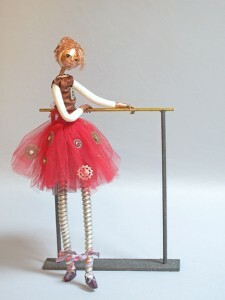 My latest art doll is “Barre-ing Degas”, and yes, she is a steampunk riff on one of Edgar’s Degas’ dancer pieces titled “Dancer at the Barre.” I like the behind-the-scenes casual feel of that painting. The young dancer pictured is not performing some grand athletic move, or spectacularly costumed. She is instead relaxed against the barre and appears to be contemplating the angle of turn out of her foot. You get the feeling that you are looking at a candid photograph rather than a posed composition. My figure has a few more bells and whistles (gears and rivets, actually) in her attire, but in her defense, she is much smaller and needs to work harder to attract attention. This entry was posted in Art Dolls, Art Shows and tagged art doll, ballet, copper, dancer, degas, figure sculpture, mixed media, one of a kind, sculpture, steampunk on October 31, 2014 by lynnadmin. Where Did That Post Go? As I was adding some images to my Art Doll page, I noticed that the post being shown as my most recent, was from a couple of weeks prior. My last post “A Pair and Repair” was back in the draft folder. Now, I’m not sure how that happened, but I’m guessing it occurred somewhere between using a laptop to do one thing, a tablet another, and updating in between the two. So, I decided to share the new piece from this week, and re-share last week’s too. This is Nobody’s Fool, and you can see she is just that. Stitching the hat was the greatest challenge with this art doll. I actually made two, as the first wasn’t quite where I wanted it to be. Last Week, I shared “Future Thoughts”. It is the second in a series. This piece takes the concept of looking forward while keeping an eye on the past (“Driving in Reverse”, the first in the series) a step further and is concentrating firmly on the future. 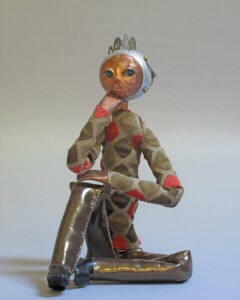 The second art doll from last week was “Fly Girl”, decked out in her brass goggle steampunk finest. I also gave an update on my three out-door Garden Dolls at the UNC Botanical Gardens show. Two required some minor repairs, as overly interested visitors tried to remove parts and pieces. 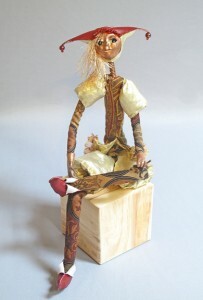 One of the three, “Tend” has already sold and will be going to a new home when the show closes. 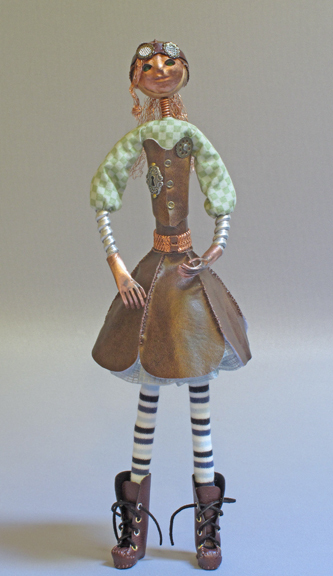 This entry was posted in Art Dolls, Art Shows and tagged art doll, copper, figure, figure sculpture, Garden art, mixed media, one of a kind, OOAK, sculpture, steampunk on October 7, 2014 by lynnadmin.